Bird baths can be traced back as far as the first century. Even though trends have come on gone, the basic shape of a bird bath has remained the same. As winter months and freezing temperatures close in, finding fresh, non-frozen water reservoirs can be a difficult and taxing affair for birds. Their preening habits require fresh water to bathe in, where they remove dust, dirt, and parasites and effectively re-oil their feathers. This coating of oil adds an insulating and waterproof layer, shielding them from the winter weather. By having clean, usable water available in your garden during wintertime, you will be giving our feathered friends a vital lifeline. In this article, we’ll guide you through how to choose the best heated bird bath for your garden. What Are Heated Bird baths? Standard bird baths are artificial reservoirs of water, usually in the form of a bowl that is either hanging on a pedestal or placed on the ground. It is designed for small birds and animals to drink, bathe, socialize and preen in. Additionally, a heating element is added to the basin to keep the water from freezing over. 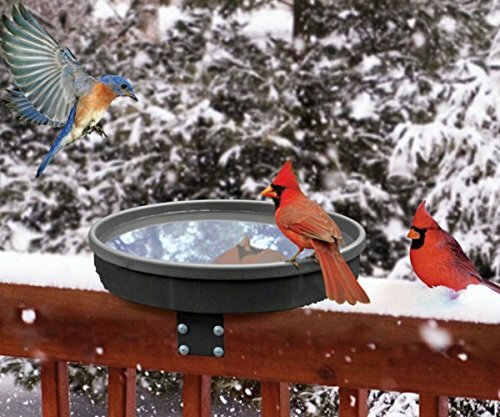 Modern heated bird baths contain a thermostat component that senses any drop in temperatures below 35 Degrees F (2°C). These components can be submerged either in the water, built into the basin itself, or attached underneath. A good bird bath shouldn’t be any deeper than 3 inches at the center of the basin. For deeper models, adding rocks or pebbles that break the surface of the water will enable smaller birds to perch and bathe comfortably. The edges of the basin ought to be sloped, and shallower than the midpoint within deeper bird baths. When it comes to choosing the right bird bath, material is a key consideration. The majority of baths on the market are made from weather resistant, BPA (bisphenol A) free plastics, which can contend with temperature changes. Another thing to note is that birds typically don’t like smooth surfaces that get slippery when wet, such as glazed pottery, glass or shiny plastics, which can reduce stability for the perching birds in colder weather. The rougher the surface, the better. 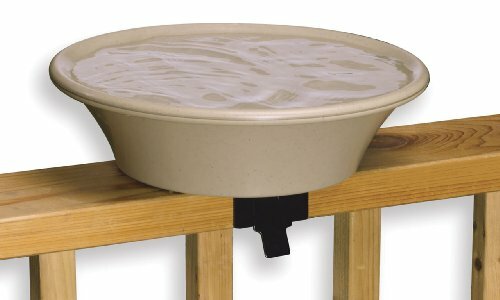 API 650 mounted heated bird bath is a great addition to decking areas and small gardens. Though it doesn’t come with a stand like some other models, what we loved most was the easy to install black, metal clamp-on mounting bracket. Just screw it onto your deck rail with no need to drill. This hefty, 20-by-2-inch, BPA free, textured, plastic basin is in an attractive light-stoned color, and sports an easy to perch rim on its outer edge. Cleaning the basin is simple as this model contains an additional EZ-Tilt-To-Cleanhinge, which is securely attached to the mount. Just tip out dirty water, and wipe the bowl clean, simple. The 150-watt heating and thermostat control elements are integrated within the basin itself and should keep the water from freezing, even at temperatures as low as -20F. The API 600 is one of the simpler models we’ve reviewed. Like the API 650, it doesn’t come with a stand, which means it can be placed almost anywhere, including on other API pedestals. 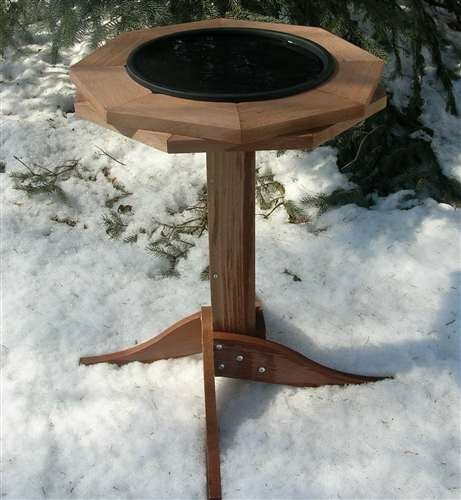 If you wanted a ground level heated bird bath this is a great option, at 20 inches in diameter by 2 inches deep, it can hold over 2 pints of water, accommodating for larger gatherings of birds. The basin can be attached closer to home too, and its easy-to-use mounting bracket fits most decking rails. We found particular care had to be given when installing the bracket, as the basin may have a tendency to tip to the side. The built-in 150-watt thermostat and heating element work well at keeping the water from freezing, and we found that it is still effective even up to -23F. The light-stone colored, slightly textured, plastic basin with curved sides provides a multi-height, safe option for your birds. This is one of the more economical heated bird baths that we’ve reviewed. Its built-in thermostat and heating element run at 75 watts and uses less electricity. Unlike other models, the basin stands 2 inches in depth, and 20 inches in diameter, but is flat and without any form of sloping, keeping water at a consistent level for bathing birds. The bowl is made from high quality, weather resistant plastic, which is sturdy and long lasting. The metal mounting bracket is highly adjustable, and has three mounting options; deck mount, clamp mount and ground use. The silver extendable arms can attach to most wooden railings and feeder poles. The outdoor safe power cord can be concealed on the underside of the bowl when not in use. The cord only reaches a maximum of 12 inches so, if needs be, you may need to invest in an outdoor extension cable. 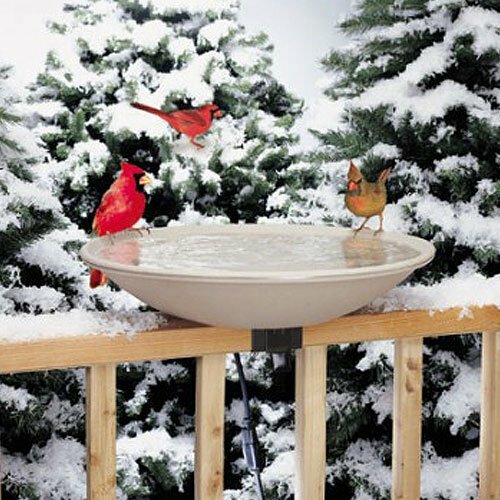 One of the main features we love about this beautiful heated bird bath is its sturdy, 30 inches high, easy to assemble, metal stand. Having this feature means that it is transportable, and can be placed almost anywhere within your garden. Alternatively, the bird bath basin can be attached to a wooden deck railing, or placed directly on the ground. However, users did note that it could become slightly unstable if it was jolted, or there were strong winds, so extra stabilization may be needed if you have a busy garden. Accompanying the stand is a large 20-by-2-inch, light-colored bath with a grip rim on its outer edges for comfortable perching. The easy to clean bowl is made from lightweight, crack-proof, BPA free plastic. The innovative thermostat and heating element, like other API models, is hidden within the basin and operates at 150 watts. 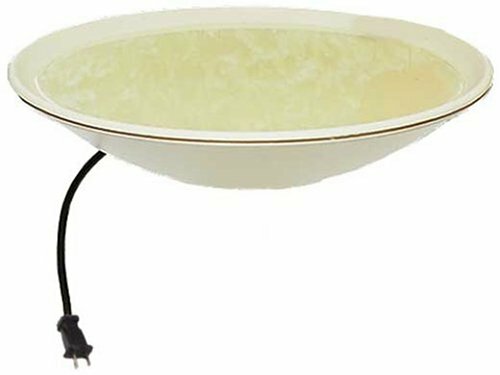 API 670 heated bird bath is on the higher end of the price scale in this list, but would certainly make an eye-catching addition to anyone’s garden. This classically tapered shaped, bygone era styled bird bath is lightweight and easy to clean. It also features API’s 150 watts thermostat and heating element. The materials used in its design have been fully tested in freezing temperatures, and reassuringly won’t crack during the winter months. 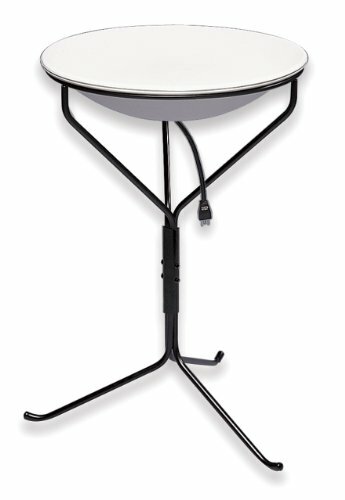 Easy to assemble, this bird bath just mounts on top of the pedestal, with the power cord and its wires secretly hidden in the hollow stand. A potential drawback is that you may have to plug an outdoor extension cord into its base if you want it to reach longer distances. Due to the lightweight material, it may be susceptible to being knocked or blown over, so it is suggested that you use sand or small rocks within the pedestal to weigh it down. This birdbath is certainly different. Made from Western Red Cedar wood; this unique pedestal boasts a natural, modern design. It does require some assembling, but once put together it is something that is quite distinctive. The flat shaped, heavy-duty plastic water basin is a bit more on the shallow side, at 1 inch deep and 14 inches in diameter. The thermostatically controlled element runs at 60 watts, the lowest wattage we’ve featured. Yet, due to its size and wattage, it is very economical to run. The foil insulated heating element is concealed within the basin, along with the thermostat. Unlike some heated bird baths, the entire bowl heats including the rim, therefore the warmth is evenly distributed. For extremely cold areas, this bird bath works consistently at temperatures as low as -10F (-23 C), keeping the water thawed but not warm. The 12-inch electric power cord can be concealed within the hollow 22-inch high pedestal itself. 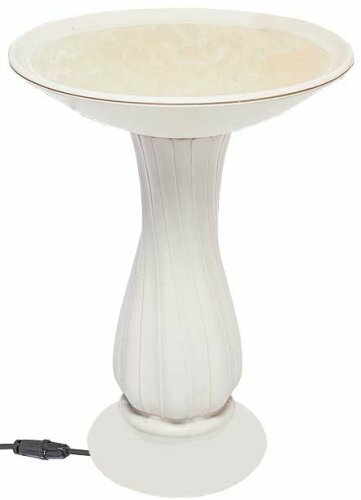 This light stone colored bird bath is a respectable 14 inches in diameter, with a basin that slopes to 2 inches at its lowest central point. The design of it gives the illusion that it’s deeper than it really is, but is an excellent choice if you want to attract small birds. A great addition to this API kit is the 24 inch, easy to mount, plastic pole, which simply stakes into the ground. However, you may have to place reinforcement at its base to prevent tipping during strong winds. The sturdy deck rail mount can be adjusted to cater for 2×4 inch or 2×6 inch deck rails. As the name suggests, it has an EZ-Tilt deck mount, so you can simply remove soiled water, and clean the basin with ease. Like the other API heated bird baths, this is thermostatically controlled, with a concealed heating element within the bowl itself, and runs at a more economical 75 watts.